This easy to install and remove carrier provides additional space to any vehicle with roof rack side rails, crossbars or cargo baskets. Easily set up and secure with clips and straps. As the carrier is frame-less, it easily folds up when not in use. Stowing gear in this carrier may provide much needed elbow room. It can make your rear view mirror usable again, or if nothing else, let you cram even more stuff into your vehicle. Great accessory for camping, road trips, and stinky sporting equipment. Oh, and its waterproof! Protecting your precious goods, rain or shine. Opens with Dual Zippers, and attaches with 8 adjustable straps 2 per side. DURABLE: Constructed of 600 D-water resistant material. SECURE: Featuring heavy duty lockable zippers and camp-buckle straps for heightened security. SPACIOUS: Over 10 cubic feet of storage and attaches to the roof top racks. 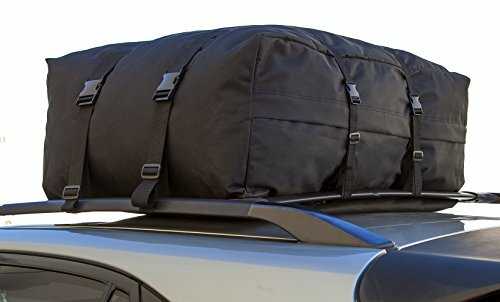 EASY TO INSTALL: Use the adjustable straps to attach to the roof top rack. When it's not in use just fold it up for simple storage.